Saint Mary-of-the-Woods College founder. America’s 8th Saint. This is the path traced by Providence. And I follow it. Born Anne-Therese Guerin on October 2, 1798, in the village of Etables-sur-Mer in Brittany, France, she took her First Communion at age 10, two years earlier than was custom. Even at that young age, Anne-Therese knew her calling. She imparted to the priest, on the day of her First Communion, that she had a desire to enter into a religious community. While Anne-Therese was eager to begin her life’s mission, it was not to be. Tragedy struck her family when she was only 15, when bandits killed her father. Her mother, who had already lost two children, fell into a deep depression, and Anne-Therese became the caretaker for her mother and sister. When she asked for her mother’s blessing to join a religious order at the age of 20, her mother denied, not wanting to lose Anne-Therese as well. Five years later, however, her mother acknowledged Anne-Therese’s devotion, allowing her to leave. Anne-Therese entered the Sisters of Providence of Ruille-sur-Loir and was given the religious name Sister St. Theodore. She took her first vows on September 8, 1825, and perpetual vows on September 5, 1831. Her first mission was to teach at Preuilly-sur-Claise. She also taught at St. Aubin parish school in Rennes and in Soulaines in the Diocese of Angers. It was during this time that she received a medal for her teaching from the inspector for the Academy of Angers. As newly ordained bishop of the Diocese of Vincennes, Indiana, one of Celestine Guynemer de la Hailandiere’s first actions was to request the Sisters of Providence of Ruille-sur-Loir to send a group of sisters to minister in Vincennes. At the recommendation of the superior general of the Sisters of Providence, Sister St. Theodore agreed to lead the mission. In 1840, Sister St. Theodore and five other Sisters of Providence left their convent in France on a journey to Indiana to establish an academy for young women. During the 40 days of the stormy ocean crossing, they were robbed of a good portion of the money meant to finance the rest of their trip. They arrived in New York and traveled half a continent by train, canal, stagecoach and ferry in a foreign land where they could barely speak the language. Finally, on Oct 22, 1840, more than three months after leaving France, the women crossed the Wabash River. In the spirit of true adventurers, Mother Theodore’s journal indicates that the source of their initial disappointment upon arrival was not that they had no home, but that they did not know where they would find students. Despite this uncertainty, students came to them seeking an education even before the College’s first buildings were erected. For more than a decade, from 1841 to 1852, this Academy was the only Catholic boarding school for girls in Indiana. In 1846, Saint Mary-of-the-Woods College was granted the first charter for the higher education of women in the state of Indiana. Mother Theodore also established parish schools at Jasper, St. Peter’s, Vincennes, Madison, Fort Wayne, Evansville, Lanesville, Columbus and Terre Haute, Ind., and St. Francisville, Ill., along with two orphanages in Vincennes. 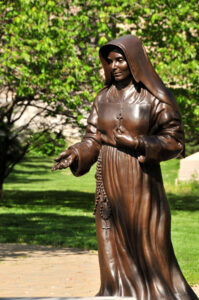 Mother Theodore was a skilled businesswoman and leader, qualities that SMWC students continue to embody today. The Sisters of Providence congregation had grown to 67 members, nine novices and seven postulants by the time of her death in 1856. Mother Theodore died at age 57 on May 14, 1856, after a period of illness, but her story does not end there. Over 50 years later, in 1907, Bishop Francis Silas Chatard, the first bishop of the Diocese of Indianapolis, requested that the body of Mother Theodore be exhumed for examination after hearing about her extraordinary life and service. When the body was exhumed, the brain was found perfectly intact. This discovery led to Chatard introducing the Cause for Canonization. In order to be canonized a saint, two miracles must be attributed. The first miracle attributed of Mother Theodore occurred in 1908, when Sister of Providence Mary Theodosia Mug prayed for another sister at Guerin’s tomb. Mary Theodosia Mug had a large abdominal tumor and when she awoke the next day, she herself was healed. The second miracle attributed to Mother Theodore occurred in 2001, when Sister of Providence facilities management employee Phil McCord prayed to Guerin for strength to undergo surgery for his deteriorating eyesight. The next morning, his vision was restored and his eye now only needed minor laser treatment to remove old tissue. Mother Theodore Guerin was beatified by Pope John Paul II in October 1998 and canonized a saint of the Roman Catholic church on October 15, 2006, by Pope Benedict XVI. 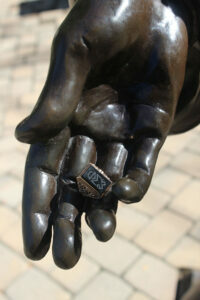 Today, current students and alums of SMWC hold Saint Mother Theodore Guerin close to their hearts. They are a part of her legacy, and she is a part of them.